‘There was no time to flee. No time to turn. No time to shriek. And there was no pain. It was like being thrown into the stars. 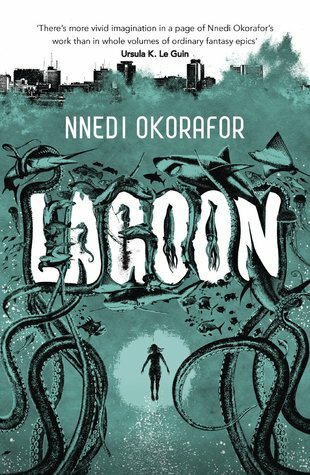 The first thing to be said about Lagoon by Nnedi Okorafor is that it is infused with this great, chaotic energy running through it – both in terms of narrative form and in actual story content. Adaora is a competent, successful marine biologist (or a marine witch, depending) who is undergoing a difficult moment in her marriage to Chris, a man she has known all her life but whose recent religious conversion is proving to be a matter of great concern. Anthony is a famous rapper, a man who can use words effectively and who is imbued with a strong sense of connection to the land under his feet. Abu is a soldier, a man with strong moral and ethical conviction whose recent confrontation with fellow soldiers probably means his – and his family’s – impending doom. There is a decentralised aspect of the narrative because the viewpoint changes from short chapter to short chapter. It’s really interesting as these function almost as vignettes since beyond the three more or less central characters aforementioned, there is also a plethora of other characters from different arenas, walks of life, circumstances. Those include but are not limited to: mythological beings of Nigerian (Yoruba) folklore and religion, religious leaders of evangelical background, the privileged as well as the poor, members of the political and military arena, the aquatic life, a road, a LGBT group, and the aliens themselves. This appearance of chaos as well as this hectic approach to the storytelling is one that works really well here – and of course that perceived “appearance of chaos” is perhaps key: as it becomes clearer and clearer as we go along with the story, how much of a narrative control is at hand here. Because Lagoon, despite its perceived chaos, holds an abundant miscellany that works as one interesting, all-encompassing snapshot portrayal of Lagos itself (and possibly Nigeria as a whole) in the way that it shows all of these possible, diverse narratives. In this book, themes as broad as gender relations, the ill-effects of colonialism and post-colonialism, the danger of zealotry and prejudice, the question of nationalism and patriotism, of history and ancestry, of freedom and hope for the future and for change are all present and accounted for. It’s a book of infinite possibilities, one who asks: how would you have felt? What would you have done? How will you proceed? Notable Quotes/Parts: You can listed to the prologue here. It’s a pretty cool introduction. I just finished this book. And I totally agree – chaotic is the right word for it! Loved the segments about the bats & aquatic life; it was so weird & unexpected. Reminded me a bit of the whole unknowable vibe you get from culthlu-esque rpg games, although I know Okorafor is (rightly!) very unimpressed by Lovecraft.